Rabbit Stew: Soaking Rabbit Picture! Here's a picture of a rabbit that I've shot, gutted, partially butchered and left to soak overnight in a tub of water that's had vinegar and salt added to it. Nothing wrong here, good composition, obvious statement. I buy meat wrapped in polythene. That's a lot grosser if you think about it. 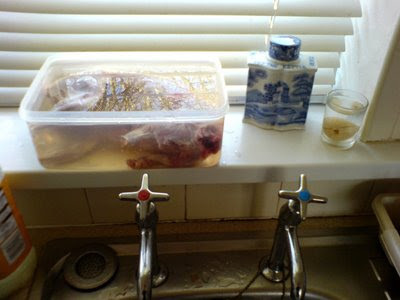 Does the vinegar tenderize the meat? Do you have any closeups of what the tapeworm cyst has inside it? Eggs, tapeworm heads, etc?